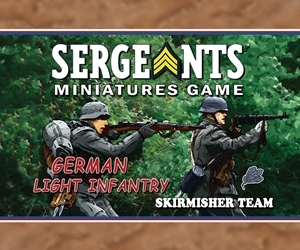 The German Light Infantry Skirmisher Specialist troops are a new addition to the SMG soldier line. These skirmishers are gritty troops who operated on the enemy front lines to assault and disrupt. These soldiers come with their basic playing cards but also 8 new Specialist cards that may include Story, Command, React and all new Equipment cards. These soldiers are a welcome addition to any players roster.